Hey guys! If you are like me, packing for camp is about the last thing you are thinking about right now. Too many end-of-year parties, graduations and cleaning out of backpacks for that business! However…There are a few things that are really important right now. This is big. They need 30 days in order to fill, pack and mail your son’s prescription medication. 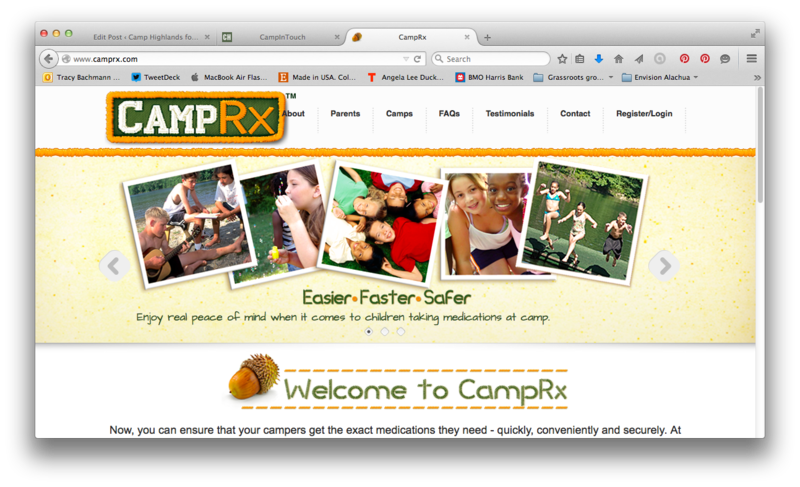 If your child is going to need medication at camp (including vitamins) you are required to utilize this service. Please call us with questions. You must go to their website and complete their paperwork. **Please make sure you complete all steps specified, including emailing and/or faxing necessary information to them. Thank you! This is just one of the measures we take to ensure that everyone stays safe at camp. We start to make travel preparations now. Please indicate on your forms how your son will be arriving at camp. How do you fill out forms? It’s pretty easy! Just log into your account and click the “forms” link. Most forms are web-based, and those that aren’t you can just scan and upload directly to your son’s record. We are getting so super duper excited to get 2015 underway, and we are thrilled you’ll be with us! We still have a few spots available, so if you haven’t already, enroll today! It is with a heavy heart that I write to you today. I recently spoke with Loren Shinn, and he passed along the news that his father and our friend Byron is in hospice care as he faces the end of the illness that he has battled these past several years. After a meeting with his oncologist, they agreed that they had exhausted their best possible treatment options, and have decided to transition Byron’s treatment plan to pain management. Byron continues to live at home, with assistance coming in regularly. While his physical state is deteriorating rapidly, he still has a warm heart and welcomes your thoughts and prayers. If you are so inclined, please drop him a note to:4309 Grand Ave. Western Springs, Illinois 60558. Byron came to Highlands after being recruited by Doc Monilaw. That was in 1953. He took great pride in telling us that he took my father on his first canoe trip. Byron has shown many of us the great grace and joy of sailing. I have never seen him more alive than when skippering a 32’ boat through the Apostles- always with a grin on his face. Byron has been an active Highlands man for most of his adult life; sharing his love of Highlands with Loren, Carter, Janine and of course, our beloved Nanette. His voice will forever be a part of the soundtrack of my Highlands experiences. Whether it is his bass harmonies on “Now the Day is Over” or his reminders to pick up the, “ever present spatula!” or hollering at campers sailing on Plum to “ease the main sheet!” This would have been Byron’s 50th summer at Highlands. Though he won’t be with us on at camp, he will certainly be in our hearts. And Byron will forever be a part of our Highlands days. Many blessings to you all, and until we meet again, fare thee well.